Being a Michael Caine fan carries with it many risks. The main one is that he makes any movie offered to him. He once remarked that, "I am an actor, and that's what I do. I don't write the stuff." But I am always willing to take a chance on one of his films, hoping that it will be another gem, such as "The Man Who Would Be King", or the beautifully scripted "Cider House Rules", or "Secondhand Lions." 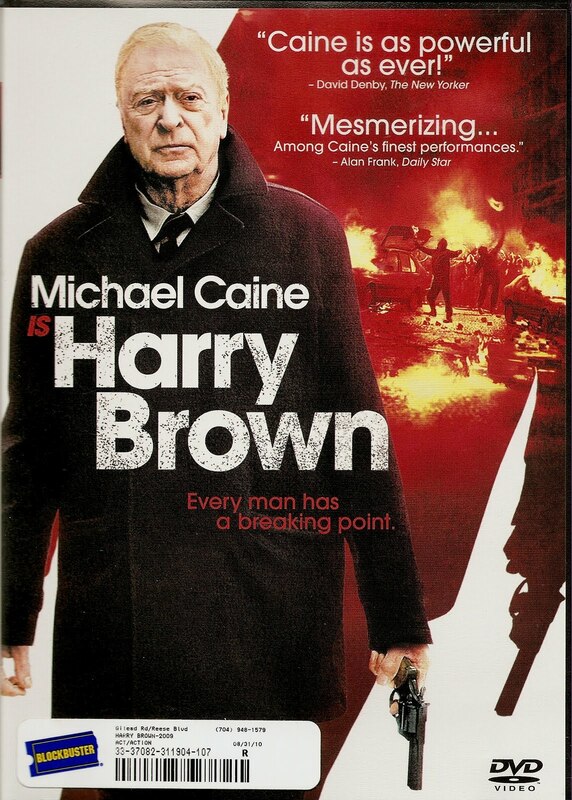 While "Harry Brown" may not rise to those levels of perfection, it is worth the time to watch. This is the British version of "Gran Torino", the American film starring Clint Eastwood as an angry old man, fed up and ready to strike back. While the theme of this movie is clearly akin to "Gran Torino", which was made one year before, this film offers you the opportunity to see that the breakdown in social order is not confined to the United States alone. This film takes place in Great Britain. Harry, played by Michael Caine, is a "pensioner", that is he is on what we call Social Security and lives in the housing project known as the "Estate." It is a typical high rise, high crime type of development which we, here in America, refer to as the "projects." His life consists mainly of going to the local pub with his friend, another aging "pensioner." His friend has taken to carrying a bayonet, a souvenir from Harry and his days as a Royal Marine. He carries it for protection against the drug dealers and thugs who inhabit the underground pedestrian walkway that leads into the "estate." Harry walks the extra half a mile to avoid the tunnel, but his friend is insistent upon his right to use it. The old man has been to the Police several times seeking protection, to no avail. When he is finally beaten to death Harry decides that he must act on his own to avenge the murder. This is where the film takes a much different turn than "Gran Torino." Harry goes on a killing spree, and although he kills only the ones involved in his friends death, he never looks beyond his own anger and rage. In "Gran Torino", Clint Eastwood's character actually learns something about himself, as well as the problems of those around him. Using this knowledge he is able to help change some of the problems that plague the neighborhood in which he lives. Not so in "Harry Brown." When about to kill one of the men who murdered his friend , he is shown a film of the actual murder, taken on one of the thugs cellphones. What he sees shocks him; his friend, insisting upon using the tunnel, actually can be seen brandishing the weapon and striking the first blow. He is then savagely beaten to death, and though his death is unwarranted, you are made to understand that it was his actions which inadvertently caused it. This is a bitter pill for Harry Brown to swallow. And for the viewer as well. Very realistic filming and credible acting make this a film worth watching, even if just as a comparison to "Gran Torino." It is interesting to see how the two films take the same theme and come to completely different conclusions concerning the same problems.